Giant cigarettes used as comparison to show the impact on health from traffic fumes. 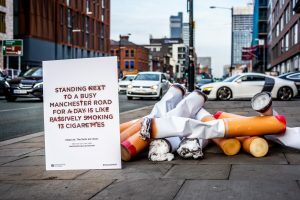 They say that thirteen is unlucky for some – and that’s precisely why Manchester has installed that number of giant cigarettes next to a busy junction on Great Ancoats street near the city centre. For, standing next to a busy road for a day has the same impact on long-term cardiovascular health as passively smoking 13 cigarettes. That statistic and the impact on health had led the Council to highlight why we all need to take action to tackle air pollution – especially in areas with a lot of traffic. David Regan, Manchester’s Director of Public Health, said: “Air pollution is a major concern and it has been estimated that across Greater Manchester air pollution contributes to more than 1,000 premature deaths a year. “We know that around 80% per cent of that pollution is from transport – and diesel vehicles in particular. That pollution increases very significantly when vehicles engines are left running – or idling. Environmental experts agree that 10 minutes of engine idling has the same effect as driving 10 miles – but the idling impact is concentrated on key areas like schools, district centres and busy streets. David Regan, continued: “It’s a big concern, but there are immediate small actions that people could take that will have a big impact. Simply turning off engines outside schools would be very beneficial, along with planning your journey before you travel or avoid rush hour where possible. Every day an average adult takes 20,000 breaths and moves around 11,000 litres of air in an out of their lungs. This is the equivalent volume as 60 baths filled with water.